To view photos of our new caviary. 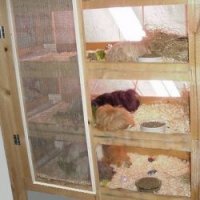 When cavies first began to arrive at our home they shared a large area in a spare bedroom. Their cage was designed using "Sterilite" tubs and wire cubes placed inside a plywood support. As the number of cavies increased, it became necessary to find other accommodations for them. 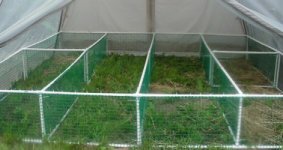 During the transition, I tried plastic tubs and modified wire rabbit cages. None of these provided what I wanted for our cavies. They were either difficult to clean or didn't provide enough space for the cavies to exercise. After looking at several photos of custom cavy housing, I decided to modify and build six "cavy condos" I had seen pictured on the internet. 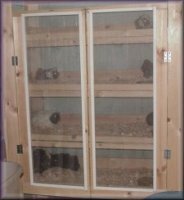 Each "cavy condo" consists of four shelves 48" long by 24" deep with double doors that open wide for easy cleaning. Each shelf is 14" high and the floors are covered with vinyl floor covering. The first level is 12" from the floor to help eliminate drafts. To discourage the cavies from leaping to the floor below, 1" x 2" boards were placed across the front of each level. Two to four cavies are usually housed on each level of the condo. For single cavies we use the same design with a single door. The size is 36" long by 18" deep. We have used these cages for more than eight years. 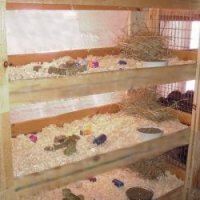 I find they allow the cavies maximum space, light and ventilation while using minimum floor space. And...they are very easy to clean. To clean - the shavings are removed, the floors are washed with vinegar, rinsed and dried. The old shavings are replaced with fresh. Although, water bottles are slightly more work, I choose to use them rather than an automatic watering system as it allows me to monitor the intake of each cage more closely. Vitamin C crystals are added daily to each water bottle. The "cavy condos" are kept in a large area adjacent to the kitchen. It is heated in the winter and air conditioned in the summer. We find the cavies are most comfortable with temperatures above 60 but below 70 degrees. We also use a dehumidifier to keep the humidity close to 50%. Overhead fans are used to provide constant air circulation. We provide unlimited food, water and 2nd cutting grass hay for our pets. I purchase fresh vegetables from a local restaurant food supplier and give them daily as treats. Each cage has a variety of toys to keep the cavies occupied so they are less likely to become bored and begin chewing their coat. A few years ago, I decided to provide an outdoor area for more exercise and free grazing. 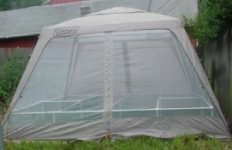 I built several 10' by 2 ½ ' pens from PVC pipe and plastic screening and placed them inside a screen house. The cavies are now allowed to play outside in comfortable weather. These are only used when I am home to watch and protect them from unexpected predators.